A new spin on a classic dessert that was invented in 1892! I feel like I have been swimming in smoothies recently! I'm in the process of creating a smoothie book (!) and have been testing and tasting smoothie recipes non-stop! Most have been absolutely delicious but there have been a few flops (the tiramisu smoothie recipe in my head turned out both unattractive and undrinkable! There will be a tiramisu smoothie recipe in the book though, it is even low carb! Thankfully after a few changes it turned out delicious!). One section in the book is called Dessert Smoothies. Not in the sense that you can only have them for dessert, but because classic dessert flavors inspired the smoothie. Desserts such as Blueberry Cheesecake, Key Lime Pie, Carrot Cake and Apple Crisp to name a few. This smoothie was also inspired by a dessert, Peach Melba. A simple dessert of peaches, raspberry sauce and vanilla ice cream, it was created by a French chef at the Savoy Hotel in London around 1892 to honor a visiting Australian opera singer Nellie Melba. Fresh peaches are just coming into season here. Nothing beats a fresh juicy peach on a hot summer day! 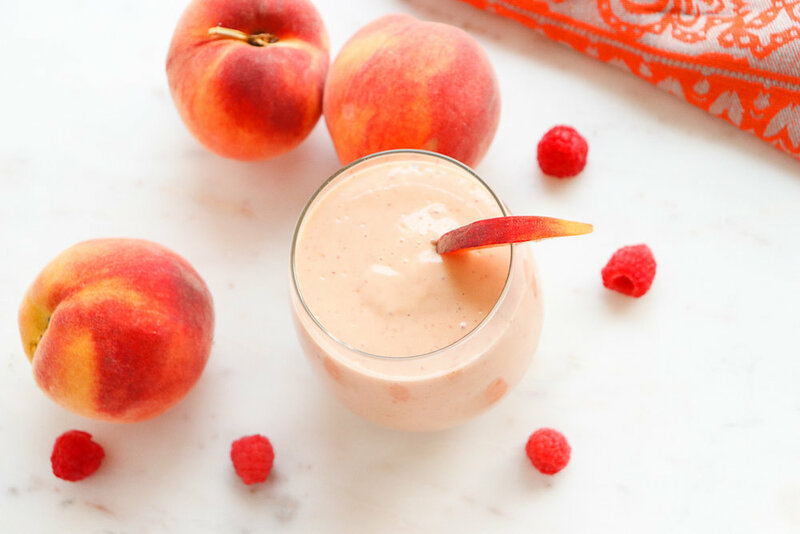 The beauty of this smoothie is that you can enjoy it with either fresh or frozen peaches and raspberries, or even canned peaches (packed in juice) that have been drained. I love the texture of smoothies using frozen fruit. To freeze fresh fruit, simply chop, if necessary (in the case of the peaches), arrange the fruit on a baking sheet in a single layer, and freeze until hard. If not using immediately, transfer the fruit to a resealable plastic bag. It will keep in the freezer for several months. Low-fat vanilla Greek yogurt subs for the ice cream used in the classic Peach Melba dessert. While not as decadent, it still provides a wonderfully creamy texture and richness, along with muscle-building protein. Apparently the original Peach Melba dessert was displayed on an ice sculpture of a swan. While that might keep it colder longer, I think you'll want to drink this smoothie long before it before it has time to melt! Combine all ingredients in a blender. Blend on high for 20-30 seconds. Pour into 2 glasses and serve immediately. *If using frozen fruit, may need more liquid.